If Salisbury Cathedral is famed, as indeed it is, for having the tallest spire of any English Cathedral, then the spire of Chichester holds the distinction of being the only one visible from the sea. But that is not all which sets Chichester apart. For in these present, enlightened times Chichester remains one of only two dioceses not in favour of, and to have voted against, the ordination of women bishops and, furthermore, whose bishop, The Right Reverend John W. Hind, BA DD, is vehemently opposed to, or so it is reported, the ordination of women generally as members of the clergy. A sad state of affairs, but more of that anon. But with what joy on the First Sunday in Advent to be collected by friends Nigel and Peter, Peter a Canon within the diocese of Chichester, and whisked off in 'Miss Pearl', their pearlescent motor car, to attend not only Choral Evensong in the Cathedral but also the Rededication of the Shrine of St. Richard. And what a splendid occasion. Sung Evensong, so quintessentially English, a procession of Bishop, Dean and Chapter, Canons and Clergy in full regalia, a triumph of organ music, incense, bells, and the vox humana rising up within those ancient walls. Perfectly placed in the front row of the Nave, we could not but wonder as The Reverend Alice Kemp, ordained daughter of the previous Bishop of Chichester, Bishop Eric Kemp, read from the Old Testament what thoughts might be coursing through the mind of Bishop John Hind. One of life's rich little ironies. Damp from a liberal sprinkling of holy water, on both Shrine and ourselves, we jointly decided against the ensuing 'bun fight' taking place in a side aisle and chose instead to accompany Peter on a tour of cloisters and precinct, scenes reminiscent of Trollope's 'Barchester Chronicles'. Later, with the November night darkening the sea to an inky blackness, we found ourselves on the Hove seafront in Marrocco's Italian restaurant where, in the splendour of original 1960s décor and furnishings, we enjoyed the most wonderful Burrata mozzarella and the freshest and best sea bass ever tasted, and talked the night away. P.S. We are so very appreciative of the concern and good wishes of so many of you during our recent, somewhat prolonged absence from, and neglect of, the Blogosphere whilst we wrestled with hospital appointments, doctors and consultants. Thank you so much. A great virtual tour, I enjoyed it all the way from here in Rome. Lovely post. How wonderful to be in Rome. We are pleased that you enjoyed the post. Oh such lovely images.Thanks for the little journey.Welcome back both of you,I hope all is well.God Bless! I'm glad to see that the cathedral is looking in such good shape, even if I am sorry to hear that it is the home of not-very-progressive attitudes. Yes, all is well, thank you so much. We are pleased that you have enjoyed the images. Chichester Cathedral is noted for its commissioning of contemporary art works which we think to be rather strange in relation to its entrenched attitudes generally. However,Bishop John Hind is due to retire next year, so that may well bring about a change of approach. Lovely post and it sounds like the perfect evening. I do like the prayer of St. Richard. I hope you are both feeling well and looking forward to Christmas. Is it your favorite holiday? I am pleased that all is now well and you are both in fine fettle for the festive season, and what a lovely way for you to begin, at Chichester Cathedral. We are so pleased that you like the prayer. We think that it is very beautiful in its simplicity. Easter time, we have to say, is our favourite period of the year, both within the Church and life generally. Such promise...!! Let's hope the impending retirement brings a change of attitudes. I've never named a car, but love the notion of it. Yes, it was the most perfect of evenings in so many ways. The Cathedral's architecture is glorious and is enhanced by many significant contemporary works of art. I hope all is well with you both as 'hospital appointments, doctors and consultants' sounds a bit ominous. I have not been to Chichester Cathedral. How lovely to see your pictures, and read about the service you attended there. I imagine it was a very moving experience, as I have always found when attending Durham Cathedral. I am so glad you had such an enjoyable evening, and to end the night with good food and company sounds just perfect. When our son was about 8 years old ( he is 32, married with a baby now !!) he came out of school saying that he would like to join the church choir. The choir master of St Marys church had been into his school to see if any boys would like to join. Our son was musical in the womb so this was one more musical thing that he could do. Because of this, we have been to most cathedrals in the British Isles to watch him sing. Chichester is a wonderful cathedral ( even though the beauty cannot be extended to the ordination of women bishops!!) and I am sure that you enjoyed a beautiful service. Our son works in the music industry so, the church choir was another mucical disipline for him. .....I also love the sound of Marrocco's and will make a note of it as our cousin lives in Worthing so dinner at Marrocco's would be lovely. The sea bass ( a favourite of mine) sounds divine. Yes, we hope so too. We were rather taken with the idea of naming a car and, indeed, Peter and Nigel have also named their navigation system. She is called Alice, perhaps because she always shows the way to 'Wonderland'?!!! Oh, dearest Abby, Durham Cathedral, it has to be our favourite of English cathedrals. Chichester, although beautifully kept, cannot match it in our view. Our round of appointments was, it has to be said, rather daunting, but they all served to confirm that all is progressing amazingly well on the Leukaemia and every other front, so our spare time was spent celebrating rather than blogging!!!! So glad you're back - hope all is well with you health-wise. A pleasure to see your photos and read your words - the Cathedral looks magnificent. Yet again, your words made me smile at a recollection of my own - strange how that happens! I used to work in a bookshop around the time 'The Barchester Chronicles' were being serialised on the television. A lady came and asked me if we had the book and I replied, 'Ah, yes, that's Trollope' - the lady looked mortified and said - 'Oh, I thought it was rather good'! How wonderful to have a musical son and, through him, to have travelled the length and breadth of England listening to church choirs.Our idea of heaven. We can certainly recommend Marrocco's on King's Esplanade in Hove. It is a time warp of a place, not at all sophisticated, but the food is superbly fresh and served with a flourish. The Romanian waiter Nick is an attraction in himself!!! We are sure that you would love it. Your words are like silk, they are flawless and smooth. I love to read your posts, not only because they are always interesting and take me out of my element, but because they are written so beautifully. The cathedral is magnificent. However, I do believe that if a church does not include 50% of the population, the people will surely leave it behind. I am so happy to see you back in our blogger world. Hope you are both well. Glad to hear that there is good news on the health front...having a husband with leukaemia among other odds and bods I do know what a relief good news is! Roll on the bishop's retirement, although I cannot help but feel that St. Richard would be backing his views. Hello Jane and Lance, and good health to you! When I see a buildimg like Chichester, I'm amazed at the labour and dedication that have gone into it. I can't think of anything we build today being comparable... I guess awe was intended. Our forebears certainly worked for the long-term. May your own term be longstanding and beautiful also. Thank you so much for your good wishes and yes, all is well with us and, we hope, with you too. We loved your story of the bookshop customer. It really made us laugh. We must confess to finding Trollope rather dry when in our youth but now he has a definite appeal. Times and tastes change!! We absolutely agree with you, Arleen, about your views on women in the church. There has certainly been much disquiet over the whole issue of women's ordination and we hope that the New Year will bring a 'see change'!!!! You are most kind about our posts, we are so pleased that you enjoy reading them. We too like being transported from our usual surroundings into the lives and times of others in the Blogosphere which are all so wonderfully rich and varied. Dear Jane & Lance - you have been missed, but welcome back. Hope all was well with your hospital visits. It is a long, long time since I visited Chichester Cathedral, and I did not realise that it is the only English Cathedral visible from the sea. Thank you for your kind wishes. It is so true that good news on the health front is one of life's greatest riches, beyond everything that money can buy. We rather like to think of St Richard as a liberal of his day, but he can, we feel, be forgiven with regard to the roles of women in the church as he lived in the C13. However, in our view, in the C21 there is no such excuse!! Dearest Faisal, thank you so much for your good wishes and your kindness in keeping in touch. We really value your friendship. The cathedrals of England are certainly awe inspiring places and do, as you say, impress when one considers the difficulties of construction of their day. Choral evensong inside one of them is, in our view, one of the most beautiful and emotionally stirring occasions one can experience. Just lovely! I am so glad that at least you are well enough to get back to us now. I hope the time of acuteness (is there such a word?) is over for the moment. Welcome back. Chichester is a lovely town, we have visited it several times in the days when travelling about was not the effort it has become now. I have been out of blog action myself, this wonderful contact with the blogging community is something I miss when it has to be put on hold. Hope to see you again soon and hear more of your adventures and quirky ideas. Thank you so much for your warm welcome back. It was, in fact, many years since we had last been in the cathedral and much had been renewed and developed. The Lady Chapel, in particular, had been beautifully restored and so it is all well worth a visit. Just the spire is visible from the sea!! As much as I enjoy Catholic rituals, I do believe Marrocco's would be much more to my liking. Fresh sea bass and Burrata mozzarella, what more could anyone ask for? The restaurant looks lovely. Glad to see you two back here! Yes, we are pleased to report that all is well with us and we do so hope that your own absence has been by design rather than by force. We are thrilled to think that you regard our ideas as quirky, we have always believed our ideas to be so mainstream and sensible!!! !Perhaps not?!!! Chichester is indeed an attractive town and at least one very good wine bar, we can report!!! Oh dear, between us we are keeping the Health Services very busy. We do so hope that you are feeling better now. Marrocco's is indeed wonderful with the most amazing seafood selection. The Burrata Mozzarella was so deliciously creamy and served with Parma Ham. Far nicer than the somewhat rubbery Buffalo Mozzarella which we have known previously!! Chichester, both cathedral and town are well worth a visit. Be sure to seek out the Shrine of St. Richard when you go!! Oh, how this evening called to me, and how I sat reading in the slow dim of first cup. My little Deep-South heart has always yearned for these pomps and pageantries, the singing and the processions, as my raising in the foot-pattin', How-Y'all-been-doin'? across the pews never did seem to measure up to the crisp worth of those services of the centuries. There's a quiet, humble feeling amongst such music and words and scents, and the sanctity of the moment lingers, lingers. I'm so very glad to see you home---I hope you're well and warm this wonderful season! Welcome back, Jane and Lance and thank you for the tour of Chichester Cathedral and a lovely account of your evening there. I haven't visited Chichester since I was a student. Your comment about the Bishop made me smile and remember that when I was appointed to my first parishes, it was as immediate successor to a priest who was just as opposed to the ordination of women and who had campaigned vigorously against it. Bishop Eric Kemp was also adamantly opposed to the ordination of women to the priesthood, though he did ordain them as deacons. I wonder whether his daughter is a priest? You are always so very kind and generous, dear Rachel, with your comments which really touch our hearts. Yes, that evening lingers on in our minds too. Sometimes, on such special occasions, everything comes together so beautifully and the event becomes memorable and lives on long after it is over. Yes, all is well with us, we are happy to say and we hope that you too are now feeling much better. Jane and Lance, this post was so atmospheric. I am not, by nature, a jealous person, but I was indeed very jealous of the experiences you describe here. Both the immersion in choral music in an impeccably-designed cathedral and the meal to be taken afterwards in a venue that looks as you describe, here. But it is not envy, as envy desires and wishes that he or she who does posses it should not. I wish you many more truly enchanted evenings such as this one, that you may, at all times, be damp with the liberal sprinkling of holy camaraderie and beauty. I was so happy to read of this, today! How marvellous to have been a successor to an opponent of the ordination of women. Perfect! Yes, Reverend Alice Kemp was ordained last year as a priest with a Wiltshire parish following her ordination as a deacon in the same parish a year previously. As you say, her father also opposed the ordination of women so one can only guess at how Bishop Eric would have viewed this particular situation. She was invited to read the lesson, we believe, as her father had long been instrumental in the restoration of the Shrine of St. Richard. Sweet ironies indeed! Unfortunately, the service of Evensong seems to be disappearing at an alarming rate from churches the length and breadth of England. Such a pity as, we agree with you, it is the most perfect time to sit in quiet contemplation after the hurly burly of the day is over. How interesting that you are now in Sweden and wonderful that you are exploring churches and villages there. All so very different we imagine from the States and a country we should be keen to visit. Dearest Fairy Goddaughter, Suze, how thrilled we are to hear from you and how kind you have been in keeping in touch with all our trials and tribulations. It was the most wonderful of occasions and our friends, Peter and Nigel are such enormous fun. The service with its attendant 'pomp and circumstance' was beautiful, although we must confess to have nearly dissolved into giggles when the Holy Water showered us!!! We shall be over to you to see what you have been up to in our absence, so much to catch up on but how exciting it all is!! Good to hear from you again! I didn't realise you were in England for hospital visits. I hope that you and Lance are well? Your evening in Chichester Cathedral sounds beautiful. I can almost hear the choir singing ;-)! We have our first Christmas performance with the choir on Saturday, in the great church of Schiedam. Very exciting! Happy evening & take care! Thank you for your good wishes. Yes, we are well and are pleased to say that all our doctor and hospital visits were very positive indeed. And now, we are looking forward to celebrating Christmas at home in Budapest. How beautifully you express here your views on love with which we can so readily identify. And so exciting to be singing in the church of Schiedam. It is so wonderful to be part of a choir and make beautiful music together. We should love to be there! So happy to hear that everything is going well on your health issues. The visit to the cathedral must have been glorious...the pictures are so inviting. Have a safe trip back home. Happy Holidays! Thank you, Adrienne, for your kind wishes. We have now returned to Budapest where we are reminiscing on this most magical of evenings spent with our dear friends Peter and Nigel. I wondered what had happened to you, glad that you are back and I hope that all the hospitals etc are a thing of the past. Having just struggled through seeing a specialist that could not speak any English, I realise how difficult some medical things are to sort out. I have never seen Chichester Cathedral but it looks beautiful. I know that Ital restaurant - but, alas, only from the outside. I used to jog past it regularly when I lived in Brighton (occasionally running right up to Shoreham and back). But I still walk past it now and again when visiting Brighton and have the time to amble down the Hove/Brighton sea-front. So next time I pass it, I'll be thinking of YOU, J & L! Oh that lovely beautiful Cathedral . I was confirmed there when I was 12 years old. The last time I visited it was to meet up with our dear friends John and Elfreda who now live at Cooden , Bexhill you may very well remember them . Lovely happy memories of Chichester. Jane and Lance, I wondered what had happened to keep you away from 'blog and hearth', but then I remembered that your pressing family duties were probably enough for you to handle during these days. Still, I worried. I'm so glad you're both back. And right away, we get this wonderful Chichester post. Sounds like you had a splendid day with friends and some wonderful food and talk at the end. What could be better? Regarding Chichester: I, too, love the irony, as I do think The Right Reverend is quite Wrong. Thank you for your warm welcome. It is good to be back, especially as we are happy to say that all the health news was very positive indeed. Of course, you, Diane, are a wonderful cook, but we are sure that you would find Marrocco's very much to your liking. It is simple food, at the peak of freshness, cooked and served beautifully. A winning combination in our book. Yes, do try to get to Chichester next summer. We think that it is a most attractive town and the cathedral is certainly well worth a visit. For many years we were devotees of the Chichester Theatre but then it had a poor run. Nowadays we believe that it is once again back on form, so perhaps an evening at the theatre might also be a super treat! When next passing Marrocco's, think of us and have an ice cream....they are iconic!!! Thank you for your kind message and warm welcome. We are happy to be once more behind the keyboard!!! Such an amazing set of coincidences here. How splendid to have been confirmed in Chichester Cathedral. Of course, we remember John and Elfreda with great fondness, not least for a wonderful 'green' arrangement which they once sent to us at a particularly bad time. It would be lovely to be in touch with them again and so do, please, remember us to them. How strange that they should now be down the road from us when we are in Brighton. Small world!! We have missed the Blogosphere too! Thank you so much for your kind and generous comment. Yes, our family concerns continue but, thankfully, our own health worries are resolving very positively indeed. It's good to have you back, with another interesing post. How lovely to hear from you again, your elegant writings were much missed. Your visit to Chichester sounds just the ticket to sooth the mind and make the heart soar, which is surely what fine churches are about. In the see and by the sea, very clever. Lovely poem, it inspired one of the songs from the musical "Godspell". If you look at my blog, you will see a photo, and you will know where WE were on the eve of Nov.27th! Dearest Elizabeth, thank you so much for all your kindness, we really value your friendship and support. Yes, all is well and we are pleased to be back too! Your comment about 'Alice the computer' really made us laugh. It really does feel as if one is being dragged down a rabbit hole at times, not to mention through a hedge backwards whilst blindfolded!!! Oh, and with hands strapped behind one's back!!! Thank you so much. Yes, we are happy to say that all is well with us. It is good to be back!! Thank you for your most kind and generous comment. We have missed the Blogosphere too! Yes, you are so right about churches being places to be calmed and comforted as well as inspired and uplifted. We certainly experienced these things on that evening. 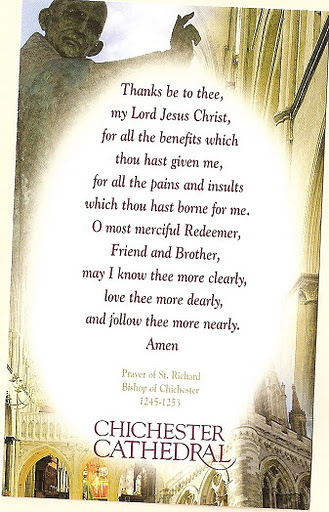 We are pleased that you too like the prayer of St. Richard. We had no idea that it found its way into 'Godspell' but think that its simple messages are so very true today as they were very many decades earlier. We shall certainly be popping in to see what you were doing on the 27th! Aha! Looks like I have now managed to add your blog manually to my reading list - it simply would refuse to come back, even though I have become your "follower" weeks ago, and it worked perfectly alright at first. It sounds like a fabulous time was had by all - probably even by the "bun fighters". Dearest Demie, how lovely to hear from you and thank you so much for your kind messages and wishes in our absence. We are touched by your many kindnesses and your beautiful gift is on its way to the framers as we write. We are certain that you would have enjoyed the evening. Such a traditional English start and finished with an Italian flourish!! As it happens, your latest post seems to have popped up on cue in our Google Reader too. Whether this will last...?!!! We sincerely hope so as we have had a number of problems with our recent Followers and their blogs and it seems to be a general issue with Blogger and Google. Yes, a wonderful evening in every way. And, the 'bun fighters' were having a jolly time with tea and cake too!! Hope all is well with you two! Loved this post - you two would love Trinity Church and graveyard in NYC (Lower Manhattan) -- will do a post about it soon! Yes, Trinity Church might well be just our kind of place. Strange as it may seem, we are always intrigued by churchyards.We look forward to reading about it. Chichester Cathedral is not one that I've been able to visit, but it's now definitely on my list. I too love Durham -- it exudes such a sense of time and place and holiness. You would think by now that those who opposed the ordination of women, would see the error of their ways, would you not? I adore sea bass and had my most memorable meal for my 50th birthday in Rome -- all too many years ago! Again, welcome back -- the blogosphere is not the same without you! Oh, dear Katherine, we have missed everyone too. Thank you for such a warm welcome back. Your kind words have touched our hearts. Yes, Durham is truly magnificent. It epitomises for us everything that a cathedral should be and more. It is such a wondrous place where the presence of centuries of worshippers is almost tangible. Eating Sea Bass in Rome sounds to have been the perfect way to spend a memorable birthday. Lovely! I'm interested in hearing more about the holy water fight! There may be drought elsewhere, and worse to come, but no water shortage where the B of C is concerned. No sprinkler either, just a frond of green! Dear Jane and Lance - It's good to have you back and to know that you are enjoying yourselves, talking the night away! We need no excuse to chat the night away!! Thank you so much for your warm wishes. It is good to be back! Glad to hear you are well. I was'nt worried for one moment, even though you have been absent, I just assumed you must be travelling back to the UK for Christmas. I imagined you on a sleeper train, perhaps the Orient Express you picked up coming from Istanbul! You Evensong evening sounds amazing, followed by a lovely dinner. I hope you now have the most wonderful festive season! I am looking forward to the Solstice on the 21st and will have to come up with some appropriate Pagan festivity in celebration. What a nice evening. I did laugh at the car's name, Miss Pearl indeed. Have you been unwell, H@@'s? Hope all is well now. I spent about 2 months in Chichester, restoring the medieval market cross, during which time I ran into my old art school foundation teacher - and ex naval officer who served on destroyers in WW2. He's probably a gonner now, or VERY old indeed. Oh, Diane, we always like to spend Christmas in Budapest. Nothing commercial, Christmas trees put up on Christmas Eve, a focus on festive food and time with family and friends, Midnight Mass and, generally, a sprinkling of snow. Perfect. Now, the Orient Express does pass through Budapest and, one day, our intention may be to be on it. Istanbul, such a mysteriously exciting destination! Yes, the Winter Solstice is always something we used to look forward to in our gardening days when daylight hours would lengthen and thoughts could turn albeit hesitantly towards spring. Yes, we laughed too! Does your car have a name? Thank you, Caroline for your warm welcome back. It is good to be here once again, we have missed everyone! We shall now look upon Chichester's market cross with renewed interest. Is there a spot marked TS was here? Regrettably, there is no cure for Hairy Cell Leukaemia but full remission, normal blood counts and regular monitoring means that all is well. Amazingly talented the Haematology Team at the Royal Sussex!! I'm glad to hear from you and to hear too that you are well. A medieval Church atmosphere followed by a good Italian seems to me like the right way to celebrate. We are happy to be back at the keyboard! Yes, the combination felt good to us too! I would love to have an evening like that--I got chills reading about it. Thank you for sharing it with us. And, how wonderful it would have been if you could have been there too. Thank you so much for all your kind messages in our absence, your friendship is so very much appreciated. Welcome back. Good to see that you are well. That little restaurant sounds great. Nothing like discovering new places where the food is fresh and delicious. Dear Jane & Lance...welcome back! I truly hope that all is well and that the scuttle of necessary appointments has settled down and you can continue to enjoy this beautiful season in joy & health, and without distraction. How glorious the voices must have sounded in the cathedral, what an amazing place...and St. Richard's prayer is one to keep close to the heart, it's lovely. Such a lovely post, and so glad to see you back. I had thought/hoped you were on a nice holiday somewhere, and am sorry indeed to learn that was not so. All the more reason to cheer at your wonderful post, and join in, as you so beautifully put it, "a triumph of organ music, incense, bells, and the vox humana rising up within those ancient walls." Oh! Must also say--I had reason to think of you particularly as I was gathering up music for the current post. I was in search of a Haydn Allegro, and found a fine one, I think. The pianist is Jenő Jandó, who, I gather, is a Professor of the Liszt Academy. I wondered whether you might have ever heard him play. So happy to have you back. We missed all your scribbles on our posts. What a perfect evening you had with your good friends. I absolutely adore (pun intended) being in church in the evening. I can just hear the giggles as you were hosed with blessings. Dinner sounded delicious. Chichester Cathedral looks spectacular and one day I will visit. My present car doesn't have a name. Of the four I've owned, two had names, Horace the Humber and Masada the Mazda. Perhaps this is the moment to 'confess' that we enjoyed Marrocco's so much that we went for a second time before we returned to Budapest. On each occasion we were welcomed and served by the most delightful Romanian waiter who, having left Eastern Europe, had great difficulty with our choosing to live there! Thankfully the 'scuttle' of appointments, as you so wonderfully phrase it, has now settled for the time being and all is well although back surgery looms in early January. But that is not until next year!! The singing in the cathedral was truly magical - a wonderful occasion and marvellous to have been part of it, albeit as observers. Alas, as you have gathered, our absence was not a holiday as such but, that said, not all was doom and gloom for all the results from the hospital were very positive and between appointments we did catch up with a number of friends which was most enjoyable and great fun. Thank you indeed for your good wishes and concern. Indeed, we do know of Jenó [cannot figure out the double accent as you correctly have] Jandó and heard him play not so very long ago at The Palace of Arts here in Budapest. We are fortunate to be round the corner from the Liszt Academy and are very often there although at present it is closed for a period of two years for restoration of the very fine Art Deco building. But, as you will know, the standard of music there is excellent. And how good it is to be back! We had fully intended to keep up whilst in Brighton but in the event we were overtaken by all that was happening, not least almost daily, and sometimes twice daily, medical appointments. But, happily, all is well although we do have to return in January for spinal surgery, postponed from nearly two years ago when the leukaemia was discovered. But how we have missed you all, and not least you, dear Helen, although we are constantly reminded of you by the beautiful calendar which, before long, will appear on the sidebar for others to enjoy as well. Now, 'Horace the Humber' - we really do go for that. But, we fear, Horace must be long since converted into tin cans, or whatever, for we have not seen a Humber in many years. An uncle, in the 1950s, drove a Humber Super Snipe, and before that a Humber Hawk! Christa, thank you so much for your wonderfully warm welcome back. You have been so kind in keeping in touch and we appreciate that very much. We are so pleased to read that you too have the tradition of tree decorating on Christmas Eve. It really does, as you say, make the day extra special and full of festive spirit. What a distinct and most interesting tour! Wonderful to see you both back on here! Hope you're abundantly healthy and feeling well! You are so sweet and kind, dear Kasia, to give us such a warm welcome back. We have missed you too. Yes, the evening was enchanting on many different levels. We are certain that you would have enjoyed the experience too. The cathedrals of England are National Treasures in our view and long may they be used and loved. Look at St Richard with his 'Godspell' lyrics! I never turn down the opportunity to visit a cathedral. They are such interesting (and often beautiful) venues. Lovely to see you back. I hope you are both 'sorted' and in good health now. I'm hoping to catch a carol service in Carlisle Cathedral tonight, but it will follow on from a birthday meal so we shall see. I was sure I left a comment on your last post. But there again our computer has a mind of it's own. We rather think that St. Richard probably got in there first with the 'lyrics'. And, who knows, perhaps it was set to some rather catchy medieval tune? Yes, we love visiting cathedrals and regard them as amongst England's most precious treasures. We were somewhat confused by the mention of Carlisle cathedral, always placing you somewhere in Germany. But, we are now assuming that this is all part of a birthday treat, how wonderful! Thank you for your kind wishes. Blogger is acting up for us too!! What an excellent 'tour' of Chichester Cathedral. Sung Evensong is indeed one of the lovliest services to attend. We used to greatly enjoy hearing it at York Minster. York Minster is, of course, one of the most beautiful of all cathedrals and how lovely to have attended Choral Evensong there, something we have never experienced but would much like to do. Thank you for your kind concern. Yes, the outcomes from the many hospital visits have been most positive and we are so pleased once more to be at home here in Budapest. In January we have a date for spinal surgery but after that it will, we are certain, be plain sailing from then onwards. One of my foundest memories of church as singing in the choir, the sounds must be tremendous from an organ in a church with such tall ceilings, Sorry to hear about the spinal surgery hope all goes well with that. I too had missed you but thought you had said you'd be back later, so nice to read your informative blog again. It's ironies like that which you describe that make life worthwhile ... But who made the pronouncement that the spire was the only one visible from the sea? I have visions of a sailing boat circumnavigating the coast with a host of 'spire spotters'! Surely that's too fanciful! I hope all is well - despite never having met you in person (and so not wishing to be presumptous) your absences are noted with alarm and I send you positive (and warm!) energy from downunder! Yes, the acoustics are wonderful in the cathedral and gave an angelic quality to the voices of the choir. A very memorable occasion. Having been mercifully free of doctors and hospitals for decades, we seem to be making up for it in great measure at present. However, light is dawning at the end of what has seemed a very long and dark tunnel and the support and concern which we have received has touched us deeply. We agree, these are sweet ironies indeed. We have to admit to having wry smiles on our faces as the Reverend Alice Kemp, fully ordained as a parish priest, daughter of the previous Bishop who was also against the ordination of women, made her way to the pulpit. Bravo, we almost cried!!! Thank you so much for your kind wishes. Your words have touched our hearts. would be so good to meet again when you're in the vicinity...any chance of an email address and we can send you ours?? How exciting all of this is! The power of the internet never ceases to amaze us!! Wonderful to hear from you and, yes, we must meet up when we are next in Brighton. We shall return at the beginning of January for a few weeks and so we must arrange something for then. please do get in touch so that we can catch up on all news. Your new house sounds most intriguing and interesting and we are pleased to read that all is well with you both. Much love from us both and speak soon we hope. My dear Jane and Lance, what fun! I can imagine what a cultured outing it would be when you and your friends driving around the country in "Miss Pearl" (what a great name for a car!!) visiting beautiful Chichester cathedral. I've never been to this cathedral but it's absolutely beautiful and sublime architecture. Have a lovely weekend. We thought that the car's name was fun too! And, the navigation system has been given the nickname Alice as it has a propensity for leading them down rabbit holes!! However, when asked if we could hear 'Alice', we were told that she was in the boot as they know the way to Chichester only too well and they find Alice's voice somewhat irritating!!! Hoping that the weather with you has calmed. Take care,stay warm and enjoy a Happy Weekend! Dear Jane and Lance, how worrying it is to hear that you are wrestling once more with health issues, but I'm glad to note that it has not dampened your indomitable form. I would imagine that the ceremonial emotion and dignity of the occasion and your surroundings was reviving, and how good it is to have such thoughtful friends, with such a fine taste in transport, to provide distraction. I very much hope that these weeks before Christmas will be free of stresses for you, and that gaiety and laughter will surround you as you deserve. Oh, dearest Mise, your warm and kind wishes have made us so happy. We are, we believe, well over the worst, with a back operation, long since postponed, as the final hurdle to be overcome. Then, we sincerely hope that it will be business as usual and, who knows, we may find ourselves raiding your shores in search of that Georgian gem before you realise!! It was a wonderful occasion and the choral evensong was very beautiful. We all behaved rather badly in the restaurant but the waiter, the fabulous Nick, said that he rather liked serving customers who were 'different' whatever that may mean!!! Miss Pearl seemed particularly apposite as our transport for the evening as the restaurant specialises in Oysters!! Oh my goodness. How thrilled I was to see you say hello over at my place as yes, I too was concerned and had been having discussions with myself like "now you just leave them alone, I am sure that everything is fine"--oh but it wasn't! If I had known I would have been sending the extra strong dose of good energy your way. Well, now I will for the upcoming back operation. And for the moral support for all involved. What a lovely evening. I am still trying to imagine what it would be like to have a vehicle with a name, let alone "Miss Pearl". Mr. Pearl is the famous corsetier, so I imagine that was taken! You say the sweetest things, dear Heather, and really everything is absolutely fine. We are in the home straight now so to speak and by mid February we are sure that we shall be totally back in business as usual form. We have never heard of Mr Pearl who sounds the perfect kind of subject for a blog post. But, hardly appropriate for a Volkswagen car we think!!! It is so good to be back and to read all your news. We shall steal the beaver fur bag on our visit, so watch out!!!! For some reason your blog was dropped by my google reader; found you agin now though. This is such a tiresome problem which we have been experiencing with your blog and several others for weeks now. It does make it terribly difficult to keep up with things and so we are most grateful that you have made the considerable effort to do so. 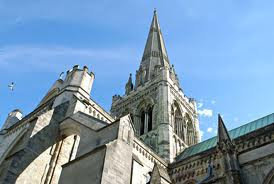 Chichester, both town and cathedral, are well worth visiting in our view, so yes, do include it in your travel plans. As you are now with us, we shall pop over immediately to see what you have been up to in our absence. I bet a choir sounds fantastic in that cathedral. What a beautiful building. Glad you're back. Hope you're doing well. The choir did indeed sound positively angelic as so befits the season! Thank you so much for your kind wishes. We are well and hope that you are too. Jane you post so rarely, that's a shame considering the impressive number of your friends here. Lovely and inspirational story of your recent religious experience. They say you can start fresh each time you are blessed with holy water :). So I wish you a happy new beginning. The Right Reverend John Hind is vehemently opposed to the ordination of women as members of the clergy? I sincerely hope that the reverend gentleman is approaching retirement age so the good people of Chichester can progress. Chichester Cathedral is, after all, one of most peoples' favourites. JAne and Lance, I so love these little peeps into occasions in your lives, that stick in your minds. Miss Pearl sounds delightful, as does your evening of evensong. It's lovely to meet you, Jane and Lance. Thank you for the very handy hit on my pending chimney manoeuvre ~ I shall need all such help in succeeding with the challenge! And all the very best with your health recovery ~ our bodies are such miraculous things. Sounds like such an awesome evening. wish we had somehing similar in California...I’ve been to Hove...cool little town with lots of neat antique shops. Hope you are doing well...much love from across the big pond. Best wishes and hope all is well! Thank you for the tour! Thank you for sharing all the wonders of the cathedral & area. I can only imagine being there & your pictures & words bring me a little closer! Have a wonderful weekend! I am so glad to see you are here and feeling well! I was not aware of these health issues, I'm sorry. I thought perhaps you were tending do your dear ailing parent. I have been thinking of you, and it is good to see this lovely post from you! I do love old churches and cathedrals, and these photos do not disappoint. And that dinner sounds fabulous! Enjoy the beautiful season, dear friends! 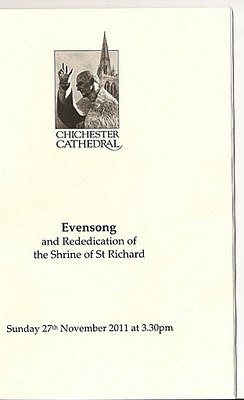 I have never visited Chichester Cathedral, although I know of Rt Revd Hind's views. My elder son went to school in Norwich and assembly was held every morning in the cathedral. I thought that was wonderful, but he was less impressed and said it was cold. Good morning! I hope that I just figured something out. I haven't been receiving notifications of your new posts on my dashboard for some time. Well, I thought that I should try becoming a member again but all I had to do was to sign in again under the member column. I think that others are having the same problem, so perhaps that will help? Off to the market! I am leaving Ben behind alas as I need to look for small presents to send to my family in the States. Sigh. Christmas is happening without me whether I want it to or not! What a lovely idea to have the opportunity, having been blessed with holy water, which we were in no small quantity, to start again. We shall do our best! That said, we are so very blessed in all that we have, not least with such wonderful friends, such as yourself, in the Blogosphere. Bishop John Hinds will, in fact, leave in April and already the process of finding a replacement is in train. Indeed, our friend Peter, as a Canon of the diocese, has been consulted by those who are involved with the appointment. It is generally thought that sweeping changes are now needed. It is to be hoped. It is rather reassuring to know, dear Alec, that we are not entirely transparent where our beliefs and values are concerned! As for the theatre of the Church, of which there is much which we love, we sometimes on that account are drawn to Rome! We have had a difficult year battling with leukaemia but are so very happy to say that, following very successful chemotherapy treatment, it is now well and truly in remission. Thank you for your concern. Thank you, David, for such a very generous comment. The posts do become a way of recording little events which, when we are very old and infirm, may well be fun to remember. We thought it great fun to be driven through the countryside in 'Miss Pearl' although were a little alarmed when, after the service, none of us could recall where she was parked! Thank you so much for visiting. It is much appreciated. How splendid that you should know Hove, Cynthia, although we are sad to report that most of the antique shops are, alas, no more. A sign of these very difficult times. Evensong in the Cathedral was absolutely magical. Thank you so much for your kind wishes; ours are sent to you. Thank you so much for your very kind wishes. We are so pleased that you enjoyed what is no more than a little moment in the life of this most wonderful cathedral. We are, of course, delighted that you have felt something of the tradition and atmosphere of the Cathedral and its surroundings, and not least of the service itself. It was a wonderful occasion and we are so fortunate to have had the opportunity to be a tiny part of it. Dear Irina,how much we appreciate your very kind and thoughtful comment. Over the past year or more we have had to battle with leukaemia which now, thanks to successful chemotherapy treatment, is now in remission. Sadly, our remaining parent is now very ill but is comfortable and is being well looked after by the lovely nursing staff of the local hospice. The Cathedral service was wonderful and so uplifting. Strangely, we have never visited Norwich which remains an English city high on our list to be visited. And we know that the Cathedral, cold or otherwise(!! ), is absolutely beautiful. As for the B of C's views on the ordination of women - unbelievable, or so we think, in this day and age. How absolutely amazing and wonderful to have sung in the choir of Salisbury Cathedral which in itself, most likely because it was completed within a thirty year period, has to be one of the most perfect of all cathedrals anywhere. And of course the setting is so very lovely in a very English way. Now we are very wistful that you will be spending the morning at the market which we should find such fun, and which together we really could set the town on fire!! As for the fur, we have ways and means!! We are continuing to experience the most frustrating of times where new Followers are concerned with their appearing and disappearing from the Google Reader in the most alarming of manners. When I saw Hattatt appear in my blog roll with a new post I let out a cheer that started the sleeping dogs! (The cat remained unimpressed, however - cats! They have no sense of community). The tour is lovely and so fitting for the season. How pleased I am to read that all went well with the hospital follow up appointments. But I am so sorry that you are to have spinal surgery in January. My sister is recovering from an operation on her spine. She saw a very good surgeon at The Spire Sussex Hospital in Hastings and reported that he has done a marvelous job. After only a week, she is now able to walk again. I do hope all goes well for you too. I thought you may be interested to know, that in the December copy of our Parish magazine, our Rector has written, "At a meeting I attended on 12th November, the Diocesan Synod voted in favour of women being eligible to be ordained to the Episcopate. This will now go before the General Synod of the Church of England next year". A small step in the right direction.... we shall see. Unfortunately, my husband did not pull your name from the hat in my giveaway. However, I have a spare copy of the 'Traditional Carol Collection' sung by choir's from Cathedrals around the UK. I would love you to have it, and wondered if I posted it on Monday would you receive it in Budapest by Christmas? I am happy to send it anyway, so please email me at: abgboyle@aol.com with your address and I will post it off to you. As always, I appreciate your kind comments on my post. I am having a very relaxing weekend and catching up on reading blogs! The first thing I`d like to say - your post is a piece of perfection. It`s so interesting for me to read about everything you`re into, and then see these things from your point of view. Besides, I discover many new things. I`m glad that you are blogging again. I considered it likely that your pause had to do with some health-releated reasons. Which is why I would like to wish you exceptionally good health in the new year. So glad to hear you are back and feeling all right. I would be giggling in the back over that woman in the church. HOw remarkable to think so backwardly in what is otherwise a very civilized country.. For shame! I am sorry that I didn't know you were having health issues, I was off the grid myself for quite a few weeks and just getting back to it. Here's hoping you are all better!! Welcome back to the world of the bloggies again. A former next door neighbours grandson used to be a little chorister at the cathedral and I remember going to see him sing in some concert or something, amazing voice, well the whole choir was wonderful and very enjoyable. Was many years ago but it's stuck in my mind. As for Marrocco's, it is a wonderful place. You simply must pop back in sunnier times for some of the special home-made Italian ice cream they do, it's out of this world. Welcome back, you have been missed but thanks be to God all is well and you are in remission. I enjoyed this post, and learned something new (as I usually do with your posts)...I did not know that the Church of England had Holy Water and used incense? I thought that Holy Water was only used by us Catholics!! so thanks for enlightening me. Hello Jane and Lance; you are in my thoughts and prayers, as always. I know, a little, of what you're going through and tuck you into prayer. Your notes are so greatly appreciated and I mean no disrespect in not writing more frequently. I'm just so dang exhausted and the paperwork is overwhelming. Your photography is fabulous and you have a great eye; always a pleasure to see your photos and read the dialogue. No wonder you have been sorely missed! Who else consistently brings beauty, song, friendship and cuisine into our far flung homes?! So happy to know you are back in good health! It is comforting to know that your loved one is in good care as well. You are right! Cats are so very cool, reserved and distant when it comes to any acts of spontaneity. But for all that we forgive them and love them. And how kind of you to welcome us back with such enthusiasm. It is more than appreciated. First, dear Abby, we are so encouraged by the news of your sister making such a good recovery from spinal surgery. Please do send her our very best wishes. We are, of course, apprehensive about the January operation but once it is over really do believe that we shall be back on course health wise. Secondly, we are so touched by your generosity of the 'Traditional Carol Collection' which we should love to have and which we know that we should so much enjoy. With regards to the details, we will email you either later today [Sunday] or tomorrow. And, thirdly, what excellent news from your diocese. As you say, slowly and surely prejudice and, we feel, absurdity, will be overcome as the Church inches its way forwards on one more of the many issues which face it in the twenty-first century. What an exceedingly kind and most generous comment. It is so very much appreciated, Olga, and valued too. Thank you so much. The past year has, we must confess, been not a little trying, and at times worrying, where health is concerned. Now once the hurdle of spinal surgery is over in January, then we shall be full steam ahead, so to speak, into the new year. Thank you so much for this kind thought and good wishes. After a somewhat difficult year we do now see light at the end of the tunnel. We are entirely with you, Deana, over the absurdity of the situation and should love to know what exactly the Bishop was thinking as the lesson was read. That he is to leave the diocese in April is, perhaps, an opportunity for change. We are so sorry to learn that you have clearly not been yourself or have been experiencing some difficulties. We do so hope that all is well now. Thank you so much, Jason, for the welcome on our return or, as you might think of it, back 'on air'. We do particularly love church music and it is always a special treat for us to hear a church choir such as the one at Chichester Cathedral. The discovery of Marrocco's, which clearly you know, is for us one of the great 'finds' of Hove. Indeed, we went back with more friends before our return to Budapest when we ate, rather greedily, too many scoops of pistachio ice cream for pudding. As you say, out of this world!! You are always so very, very kind with your comments which we do so appreciate. And yes, excellent news on the leukaemia front with the next check not due until May of this coming year. Do be assured that some parishes within the Church of England can very readily rival Rome when it comes to incense, bells and Holy Water all of which, if truth is to be told, we rather like. And of course, here in Hungary, a Catholic country, these are all very much part of church ritual. And thank you again for such a warm welcome to mark our return! We are not so easily got rid of!! Dearest Sandra, we do not expect anything at all at any time beyond knowing that you are safe, well and finding the strength to carry on during these very long, dark and lonely days. And to know we are in your prayers is a great joy and comfort as we do hope that you know too that both you and Dave are constantly in ours. And, dear Sandra, may you know real peace this Christmastide. Carol, we do not believe that you could have written a kinder nor more generous comment. We are very, very touched by what you have said. Thank you so much. Irina, your love and concern shine through your words which serve, even though we are so far apart, to bring us together. We are truly grateful for such kindness. Thank you, dear friends, for visiting, and for your most kind comments! It is so important to see the light and humor in life's situations...it keeps us relatively sane, I believe!! You always manage to bring that essential joy and beauty to your life and message.. It was, as you may imagine, a most wonderful evening made even more so by being spent with very dear friends. 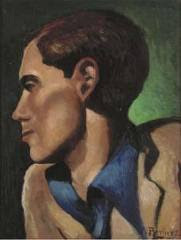 We were most intrigued, Linda, that you should have sold your painted furniture, something which we very much like and admire, to a dealer in Chichester and, through that connection, to Maggie Smith who, as it happens, is a best friend of one of our best friends, B, whose husband wrote plays for The Royal Court in Sloane Square. Such a small, connected world! And butler's trays we consider to be most useful and desirable pieces of furniture. Lucky MS! We derive such enjoyment, dear Irina, from all of your posts so the pleasure is entirely ours. And isn't it wonderful how there is a very real sense of personal connection even though we are far apart and have never met? One day, we hope! Wow, Jane and Lance, it really is a small world isn't it? Every time I see Maggie Smith I get a little sigh of satisfaaction thinking that she is serving tea from my butler's tray. Of course she may have bought it for someone else, but it's nice to dream! Oh, count me in as one of those happy to see your post ! I have not been here as often as usual, guests and then recovering from guests .. and now the heat of summer makes me wilt and it is Christmas time ! I need a rest. Jane and Lance. I have never been to Chichester but the cathedral looks lovely. I must pop in and have a look one day. As an unbeliever, though I appreciate the tradition the CoE upholds, I do find it rather mystifying why they seem at present to be so preoccupied with matters of gender and sexuality. We have a most iniquitous societal system ruled by Mammon and if ever there was a time for a moral intercession by those with a "higher" perspective, this is it. And yet they are oddly silent on such pressing issues, preferring instead to argue over what God thinks about women priests and homosexuals. It really does puzzle me. I am glad to hear of the progress against the leukaemia. I understand that great strides of progress have been made against it in recent decades, I am pleased to hear of the positive developments in your case. We should certainly, if we were you, believe that MS is serving tea from your butler's tray. We are sure that she would have been bound to have kept such a pretty thing for herself!! We loved the candle holders and, complete with cherubs, they seemed absolutely perfect for the season!! Thank you so much for your kind message, dear Candice and, thank you for the e-Christmas card which really did brighten up our day. It seems so very strange that you should be wilting in the heat whilst we are shivering in the cold here, but no snow as yet. How lovely to hear from you. We hope that you are now fully settled back into life in Australia and are looking forward to Christmas on the beach! Thank you for your kind comments about the images, although we have to reject hundreds which somehow manage always to look as if they were taken on the Titanic!! How often we say the same kinds of thing about the Church of England. So much preoccupation with 'theology' without, seemingly, a public voice on the enormously corrosive issues in today's society. Yes, we have been very lucky to witness some cutting edge treatments with regard to Leukaemia. The developments, as you say, in recent years have been amazing. It is a medical success story. Thank you for your kind words. They are much appreciated. What a great virtual tour. Loved the pics and your sublime narration. My favorite is the second pic, its so pretty. What a lovely post I could almost hear the singing and what a delight to listen to the reading from an ordained woman. Thank you so much for your generous comment. We are so pleased that you liked the images. The architecture really is very splendid. The singing by the choir was lovely and the acoustics in the church are excellent, adding to the magic of it all. Yes, we smiled broadly as the Reverend Alice Kemp took up her position in the pulpit!! We are rather sad that evensong is disappearing from church calendars the length and breadth of England as it is our favourite service. We are pleased that you enjoy it too. We have friends who are Quakers and although we have never been to a meeting with them we should welcome the opportunity for quiet reflection that we understand are so much part of the experience. My humblest of apologies for not visiting you wondrous blog in many a while. Have been going through a time where the colours of the rainbow had faded to black and grey and white. Yet, now I return. I note that you always endeavour to comment back to each comment individually. You get way more comments than me and I do the same as you in so far as commenting back to each person. In doing that, it can take me several hours. This makes me wonder how you possibly find the time to comment back to each person and then comment on other blogs. Quite amazing. Anyway, now to this posting. My goodness, this certainly was an 'in 'spiring' posting and you have brought to light some fascinating info, complete with accompanying photos and captions. I am always in awe when I go to a Cathedral. I was inside Durham Cathedral last year and the cavernous structure took my breath away. It’s so nice to see you again on this blog, Jane and Lance. When I have a chance to visit Britain, I’ll put Chinchester on my itinerary. The Cathedral with spire soaring to the sky is magnificent, while the inside is dim and solemn which would make people feel separated from the outside earthly world. Stay warm and take care. We are, of course, delighted to hear from you, Gary, but are deeply sorry that things have not been at all good for you recently. We do so trust that for now there is some light in the tunnel and that the rainbow is regaining a little of its colour. All of that is easier to say than to effect, but we should wish you to know that you are very much in our thoughts. Like you, we believe that if people are kind enough to comment, and to take the time to do so, then the least we can do is to respond to what they say. This does, of course, take time but brings with it so many rewards not least that of forging very real bonds and friendships with so many different people around the world. Durham Cathedral is truly awe inspiring even without the spire(!!) and remains one of our favourites. It is high time we revisited. The music to be found in English cathedrals is, we feel, something very special indeed and how lovely it must be to have been very much part of that whole experience. 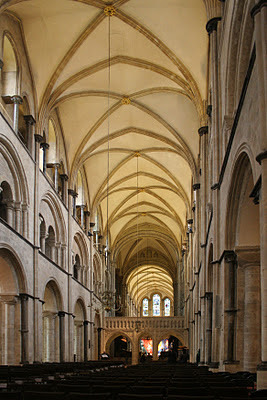 So many of the English cathedrals have the wonderful atmosphere such as is to be found in Chichester. They are, each in a different way, so very awe inspiring, not least on account of their, for the most part, great antiquity. We do so very much hope that all is well with you, Yoko, and that you continue to take care. Hello dear Jane and Lance - it's so, so good to have you back. I hope that all is well on the medical front. What a beautiful cathedral and I love that the lovely Reverend Alice delivered the reading. Sounds like a great evening all round. Talking into the wee small hours with friends - can't think of many better ways to pass the time! Thank you so much, Stephie, for the warm welcome after our absence which was rather more prolonged than we had thought that it would be. Chichester Cathedral is indeed a lovely building which, somewhat surprisingly, contains a number of excellent pieces of commissioned contemporary art. All most interesting and unusual for such a place. And yes, we had such fun talking far into the night with our friends!! Welcome back! I hope all is well and that you have not been too exhausted from the round of doctors' appointments. It sounds like you had a lovely First Sunday of Advent. 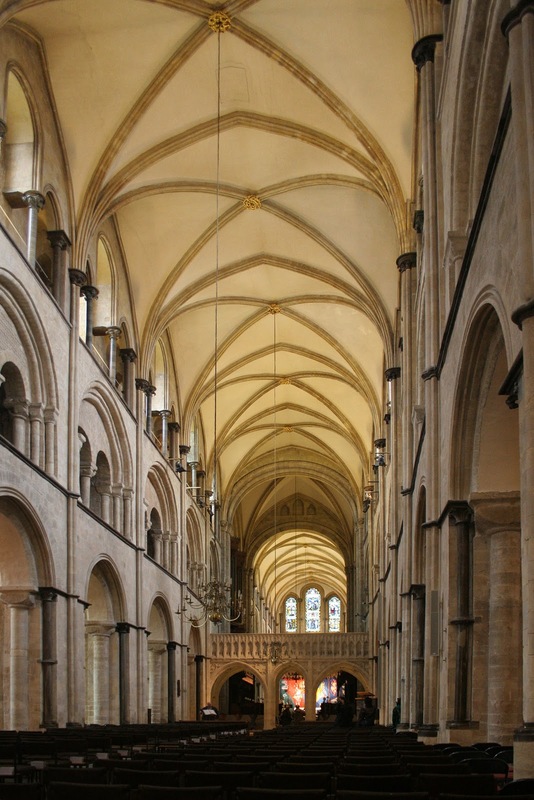 The photos of Chichester Cathedral are beautiful. We just celebrated Lucia on Sunday, which is also the Third Sunday of Advent (Lucia is actually tomorrow, but the weekend is the only time which would work for the whole family). Best wishes for the holiday season ahead!! Thank you for your most kind and caring comment. All is well with us, we are pleased to say and we hope that it is the same for you too. We have not heard of the celebration of 'Lucia' but shall certainly research it further. It is so good to gather family together on such occasions and it is often difficult to gather everyone in the same place at the same time. Wishing you and your family Happy Holidays!! So many of the English cathedrals are worthy of visiting and are, we feel, very much part of our heritage. Both Chichester and Salisbury are splendid examples. Ahhhhhhhhhhhh, Marrocco's ice cream by the seaside,nothing better.